Between February and June 2018 we ran a pig club as our pilot CSA project, in which members received a quarter pig for the freezer – in various cuts and joints. Our native breed pork is humane, healthy, sustainable and fair, without the pollution, farrowing crates, antibiotic overuse and soya-from-what-was-the-Amazon-rainforest, that characterises industrial pig production. Thanks to the success of the pilot, we are now in preparation for Pig Club 2.0. 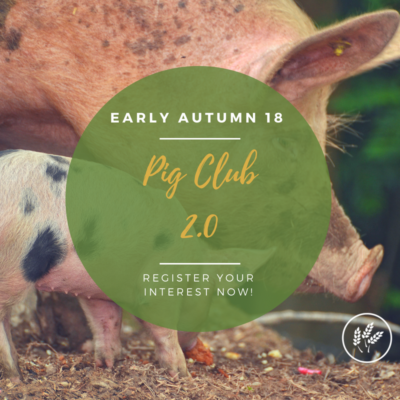 With our impending move to a new site, we are only registering interest in Pig Club 2.0 at this stage, but will continue to update our website with more details ASAP. Membership of the pig club will involve an advance payment of £119 which will pay for the pigs, feed, and butchery. Membership of the pig club will also involve the option to meet the pigs and attend a bring-and-share meal when they arrive back from the butcher. The pigs will receive the highest standard of husbandry and be fed a diet of Irish organic cereals and pulses. Jubilee will use the information you provide on this form to be in touch with you and to provide updates and marketing. You can change your mind at any time by clicking the unsubscribe link in the footer of any email you receive from us, or by contacting us at mail@jubilee.coop. We will treat your information with respect. By clicking below, you agree that we may process your information in accordance with these terms.